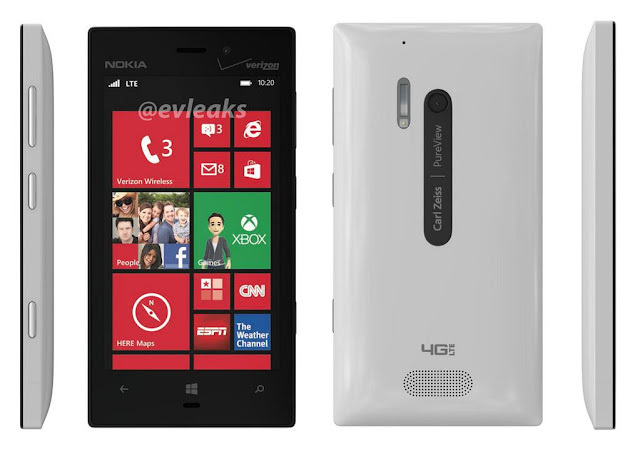 Verizon just officially announced the Nokia Lumia 928. The well-appointed Windows Phone device will hit stores on May 16 for $100. The handset features a big 4.5-inch AMOLED screen along with an 8.7-megapixel camera backed up by a Carl Zeiss lens and xenon flash. Other goodies included on the Lumia 928 include special camera apps such as Smart Shoot, which allows you to snap five pictures in one burst, while Cinemagraph captures HD video for sharing. Like many of today's modern smartphones, the Lumia comes with a Panorama mode, plus it has Optical Image Stabalization (OIS), something of a rarity in phone cameras. Taking a page from many of Verizon's past devices, the Lumia 928 connects to Big Red's 4G LTE network for fast data and the carrier pledges it will be "Global Ready," meaning users can pop in GSM SIM cards to access cellular airwaves worldwide. NFC will be onboard as well for quick Bluetooth pairing with accessories. The phone looks striking, with sharp lines and a slim profile. One downer; Nokia confirmed that the 928's chassis will be formed from polycarbonate (fancy word for plastic) and not aluminum. Nokia also says the handset will support wireless charging, a feature the company's past Windows Phone 8 devices flaunted. Hopefully we'll get our hands on this hot number soon, so be sure to check back for a full review. Until then, here's Nokia's official sizzle reel.